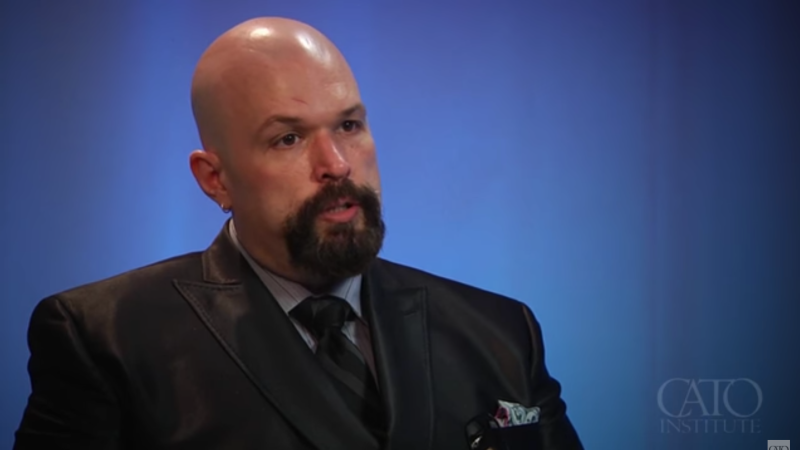 Kevin Williamson’s short-lived tenure at The Atlantic came to an end on Thursday, after editor-in-chief Jeffrey Goldberg announced to staff that the magazine and the conservative columnist would be “parting ways.” The firing came after Media Matters excavated comments he made during a 2014 podcast, Mad Dog and Englishmen. “I’m absolutely willing to see abortion treated like a regular homicide under the criminal code,” Williamson said in the podcast. He then expounded on his perspective that abortion is a crime and should be treated as such, including criminal punishment for people who have abortions. For Williamson, those punishments include the death penalty, specifically hanging. “I would totally go with treating it like any other crime up to and including hanging,” Williamson says. He prefers hanging as a method because, even though he’s “kind of squishy about capital punishment in general,” he has a “soft spot for hanging.” He reasons that hanging offers the spectacle that such state rendered violence deserves rather than the clinical remove of lethal injection. “If the state is going to do violence, let’s make it violence,” Williamson argues. Such violence is just, Williamson suggests, because abortion itself is uniquely violent— “premeditated,” “clinical” and “in some ways...worse than your typical murder” since it’s performed “against the most vulnerable sort of people.” Williamson, speaking with Charles C.W. Cooke, acknowledges that “as a practical matter” his arguments—that abortion should be criminalized and punished under the criminal code, including death by hanging—are unrealistic. Such a suggestion, he implies, is strictly a philosophical exercise that takes his point of view to its violently logical conclusions. Media Matters’ work came on the heels of a memo in which Goldberg defended Williamson’s hiring: Shortly after the announcement, many of Williamson’s worst opinions were recirculated on the internet, including a series of since-deleted tweets where he argued, much like on the podcast, that women who had abortions should be hanged. Goldberg’s line of reasoning, that it was just a tweet, was reiterated by the New York Times’s Bret Stephens: “I jumped at your abortion comment, but for heaven’s sake, it was a tweet.” Williamson’s critics, Stephens wrote in an op-ed styled as an open letter, “show bad faith when they treat an angry tweet or a flippant turn of phrase as proof of moral incorrigibility. Let he who is without a bad tweet, a crap sentence or even a deplorable opinion cast the first stone.” But as the Media Matters’ archival find makes clear, this is not simply a tweet, but rather evidence of a broader philosophy about abortion, punishment, and criminality. Goldberg’s note to The Atlantic’s staff alerting them that the publication had parted ways with Williamson conceded as much. “The language he used in this podcast—and in my conversations with him in recent days—made it clear that the original tweet did, in fact, represent his carefully considered views,” Goldberg wrote. It is incredibly rich that Goldberg and Stephens both, as well as many of Williamson’s defenders, spent a great deal of time arguing that a writer didn’t actually mean what he wrote, or that it was simply a mistake. Sure, a tweet is a tweet, but most half-baked tweets don’t argue that the state-sponsored murder of millions of people who have had abortions is either a logical conclusion or simple wish fulfillment. If anything, it’s further proof that Williamson’s cliche conservatism (opinions which have been rehashed by numerous outlets and are not worth repeating) is just that, despite both Goldberg and Stephens’s arguments that there are uniquely interesting and meritorious. The argument that Williamson provides diversity would almost laughable on its face if it hadn’t recently become a philosophical perspective at the op-ed pages at numerous legacy outlets. At The Atlantic or Williamson’s former home, The National Review, such lines of inquiry were evidence of some kind of intellect, of a “provocateur,” a classic polemicist, or a “provocative right-wing voice.” Central to the media’s recent construction of the provocateur is that they don’t believe what they are actually saying. Rather, they are just engaging in the intellectual pursuit of inquiry for the sake of argument. Advocating that women should be hanged in a public spectacle of state-sponsored violence was extreme, both Goldberg and Stephens’s acknowledged, but it wasn’t reflective of Williamson himself, rather just his unique (and sometimes controversial) approach to the discourse. It says something about the legacy media that Williamson’s perspective is believed to be unique—or “diverse.” Arguing that women who have abortions are murderers isn’t a unique point of view, but believing that it is insightful or interesting only speaks to the remove of op-ed pages from communities where this is pretty status quo. Indeed, a quick look at abortion policies on both the state and federal levels show a country that isn’t legislatively that far from Williamson, save the death penalty. Women’s bodies are routinely subject to the panoptic view of the state and its laws, criminalized for miscarriages, and denied what’s been determined to be a fundamental right of citizenship. Even Donald Trump, despite Williamson’s disregard for him, agrees on this point: During his 2016 campaign, Trump said that women should be punished for abortion. What is clear, as this spectacle came to its inevitably cynical conclusion, is that responses outside the framework of traditional debate, including questions about why Williamson was hired or anger over his hiring, are well outside of the proverbial boundaries of inquiry. They are not “ideological diversity,” but rather Twitter mobs or “outrage” or, at their worse, dampening free speech. What’s clear, in this frame, is that criticism is not provocation and those who write it are not provocateurs or polemists, rather they are simply dismissed as an angry ill-informed mob. But the mob, in this case, argued something apparently radical: Believe the provocateur, he isn’t merely “trolling.” Goldberg, at last, seems to understand that Williamson truly meant the very things he built his public reputation on. The one that, presumably, caught Goldberg’s attention in the first place.